Sometimes you just have to hug the sadness away. I love this song, and I always envision Todd and Selkie doing the “goofy living room dance” whenever I listen to it. Yep, the Elpheba comparison was me. Personally, now that Todd has adopted her, I connect Selkie with “The Wizard and I”. It’s got the “the future looks bright” and “things will be different” elements of Defying Gravity, without the touch of apprehension and unease you feel at that part of the story. Wicked was a great play. I loved it and I definitely see the similarities. I see the similarities, I hope Selkie’s story turns out sweeter. Also I love the musical Wicked yay! Unrelatedly, is she speaking, like, off-Gaelic? It would make sense for a person named Selkie. Also, tochte can mean “taught” in German. wicked was a book first. it is the best book ever. read it and cry at the end. then read the rest of the series. I wonder what Crook will think with the new gust of honer.? Kindness? Hatefulness? So many thing to come… Will we see Selkie origins? What past Todd Smith shaped him ta be so? What crazy stir shall happen? You cannot fathom how I long for more good sir! ( l ) I’ll shall watch for now, as I always have. Will the cat try and eat selkie? or am i wrong about her being kindof fish like? I am adopted myself and 33 years old. Every August 7th, my Mom and I celebrate our Adoption Day anniversary as Mother and Son. I just found Selkie tonight. I love the story and the art. She’s won my heart as well for her sweet, blunt, and very special way of looking at the world and her friends. She’s a special girl. A great strip! And yes, I cried. 🙂 Thank you for showing the wonder and true depth of adoption. I love this comic so much it is like hands down my favorite Please Please Please! Keep it going for forever! Haha and it’s so so so super cool that you actually respond to people’s comments it seems like you really are listening to your readers unlike others. I just wanted you to know that it makes us readers feel super special knowing you pay attention! Haha keep up the amazing work!! I love giving and receiving feedback from you guys. ^^ Thank you! I’ve never teared up over a web comic. The last panel… Silly pregnancy makes me weepy. ,Awwww, I knew they were going to hug. And I don’t know why but her language looks familiar. Is it rooted from a real language or just random? It’s random. I talk gibberish to myself until I get a mishmash of syllables that sounds “right”. I’ve also been writing down the made up words and grammar structure as I go so I can keep it consistent. That’s the best way to do it. I’ve created several languages for variouis adopted kids in my Jade Griffin Journals stories. Say, you might be interested in my adoption stories. I’m more a writer than an artist in my opinion (my husband thinks I am the opposite LOL) but if you’d like to take a look, they’re all online (though I haven’t put up the most recent ones yet). It’s a series of journals written in first person and the longest fan fiction you’ll ever find combining the realms but original characters for Gargoyles, Gummi Bears, and Thundercats, plus a few other fanverses thrown in. Link provided. I’ll check those out, thank you Jade. Quick question: Is the “ch” like the “ch” in chair, or in “loch”? 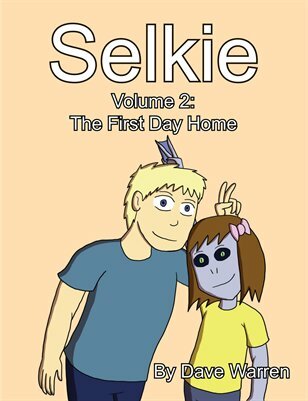 What a great way to introduce part of Selkie’s original culture! This was a special strip:) Also, love the second-to-last strip. Selkie’s face is beautifully poignant! …Awww … poor Georgie! Well, maybe Todd can bring Selkie for the occasional visit or something. Hmmm … might cause the occasional bit of turmoil amongst the denizens of the orphanage though. Ohmygod panel 5. She looks so sullen. If Selkie was there for three years, does she know who her parents are? My bet is that she was probably found at see or on a beach after getting lost then ended up at the orphanage. Either that or she has amnesia or something. Wait a tic… Other language? Hmmm..
Is it strange that when I used detect language, Tochte turned to daughter, from german to english? I’m thinking tochte isn’t german, but more, related to a different language. Since her name is Selkie, it makes me think she’s some form of amphibious race, either that, or an actual selkie (makes sense almost, for being fey-like, and liking fish). Tochte could be a fey language.